Dying Hindus in Bangladesh: A concern of US, not of India. What a shame! While US is deeply concerned with the attacks on Hindu minorities in Bangladesh, a blind Indian Govt. is worthlessly keeping silence. 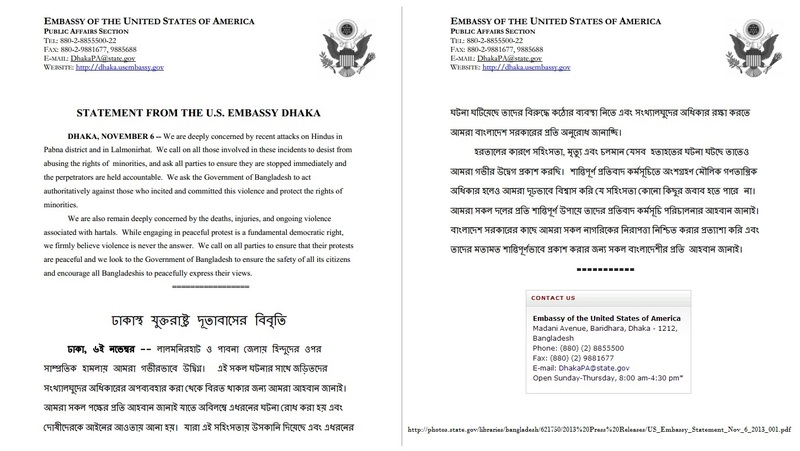 Statement from the U.S. Embassy Dhaka: Urges to stop Attack on Hindu Minorities in Bangladesh. Upananda Brahmachari | HENB | Dhaka | 07 Nov 2013:: The United States expressed deep concern over the recent attacks on Hindus in Pabna and Lalmonirhat and asked the government to take action against the criminals and protect rights of minorities. “We ask the Government of Bangladesh to act authoritatively against those who incited and committed this violence and protect the rights of minorities.” – the statement ascertained the crucial intimidation on the marginal Hindu minorities about to flee from Bangladesh to find a safer place in Bharat. “While engaging in peaceful protest is a fundamental democratic right, we firmly believe violence is never the answer,” the statement added. “We call on all parties to ensure that their protests are peaceful and we look to the Government of Bangladesh to ensure the safety of all its citizens and encourage all Bangladeshis to peacefully express their views,” said the statement. While the US Govt. is deeply concerned with the attacks on Hindu minorities in Bangladesh, a blind Indian Govt. is worthlessly keeping silence. They have many issues like CHOGM, coming elections, Communal Violence Bill, minority rights in India, but they never make out some seconds to think over the fatal fate of the Hindu minorities of Bangladesh or their rights truncated out. The post pronouncement (from the beginning of the death sentence ordered to 1971 war criminal Delwar Hossian Sayeedi to the 152 soldiers for mutiny crimes in 2009) conflicts between the ruling Awami League and the opposition lead by Bangladesh Nationalist Party (BNP), always tormented the fate of the decreasing Hindu minorities in Bangladesh in a regular basis. Hindu properties are always in the direct target of BNP-Jamaat or Awami League in disguise. Though the ‘Jamaat-BNP men’ were allegedly accused for all the major attacks upon the Hindu minorities in recent, the so-called friends of Hindus and ruling Awami League has been completely failure to give any safe guards to the persecuted Hindus in Pabna or Lalmonirhat. 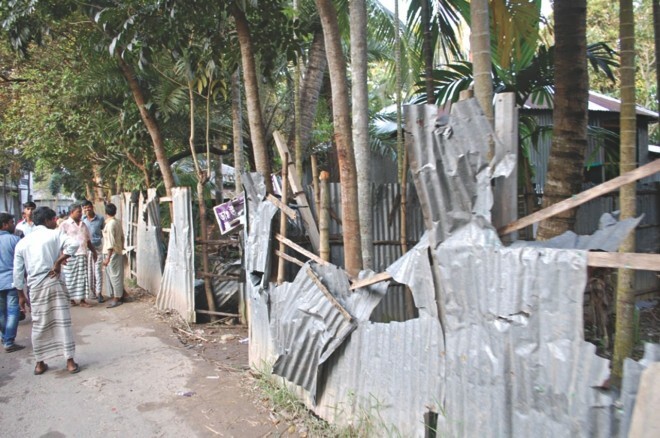 On 3rd Nov, a Muslim mob, frenzied by a baseless claim that a Hindu boy disrespected Prophet Muhammad, tore apart the corrugated iron sheet walls of a Hindu house at Bonogram in Santhia of Pabna Upazila, in order to vandalize the Hindu house hold and to spread fear among the Hindu minorities. The fanatic Muslim claimed one Rajib Saha, son Babul Saha had maligned Prophet Mohammad in a facebook page. A mob went on the rampage in Bonogram-Santhia Hindu- dominated neighbourhood following reports that the boy from the minority Hindu community had committed blasphemy, prompting the country’s High Court to order arrest of attackers within 24 hours. The Muslim mob satiated themselves by vandalizing 26 houses, damaging several idols in temples and private houses and and forcing about 150 families to flee the area. The incident prompted the High Court to take suo motu cognizance, asking the Inspector General of Police to ensure the arrest of the culprits within 24 hours and deployment of adequate police forces in the area to protect the minorities. “We have arrested nine of the perpetrators of the attack in the past two days and are looking for the others,” officer in-charge of the local police station Rezaul Karim told Indian News Agency, PTI. Rajib Saha is a class-X student of Bonogram Miapur High School, preparing for SSC examination and his father, Babul has a shop in the Bonogram Bazaar. Attack and Atrocities upon Hindu Minorities in Bangladesh are all time high. Soon, hundreds of people stormed Babul Saha’s house in Bonogram. Unable to find the boy, the mob got hold of Babul and took him to the bazaar. There, he was warned that he and his son would be tried for “defaming the prophet”. Despite protesting repeatedly that his son was innocent, Babul was mercilessly hit and kicked upon. At one stage, some locals intervened to save him and confined him to a shop. In the meanwhile, another gang of Jamaat e Islami and BNP, more aggressive and violent, set fire to Babul’s house. Later, more gangs joined in to attack the predominantly Hindu village and vandalized about 26 homesteads. Police and RAB (Rapid Action Battalion) reached to the spot after the fundamentalists completed their Islamic duties to the Hindu kaffirs as prescribed in the unholy parts of Quran. Basudev Dhar reports in Dainik Statesman that the attack on Saha family of Bonogram is nothing but a planned conspiracy which was hatched out of a denial of paying a ransom of Rupees Two lakhs as claimed by some Muslim hooligans at the time the marriage of his daughter some months back. As Babul Saha, a rich businessman of Bonogram Market denied to pay that unreasonable amount, the perpetrators threatened him for a dire consequences. Consequently, the attack on Saha family came to them and others during the hartal hegemony. Actually, the BNP-Jamaat supported Muslim perpetrators and even the communal elements in others parties regularly collect the life-saving tax (read Jizya) from the Hindu minorities under severe pressure and persecution. On 4th Nov 2013, at least 15 people, including six women, were injured when some BNP men stormed a Hindu village and vandalized and looted houses at Satpatki Majhipara under Lalmonirhat Sadar upazila. Villagers complained that they came under attack as they refused to pay an extortion demand by the BNP men. Traumatized by the violent attack, Hindu women and children of 125 families fled the village and took refuge in Muslim neighbours’ houses at a nearby village, said Jamir Uddin, officer-in-charge at Lalmonirhat Sadar Police Station. But, it has been reported that extradited Hindu victims in their new refuge again face humiliation, molestation, taxation, persecution and all morbid situations. 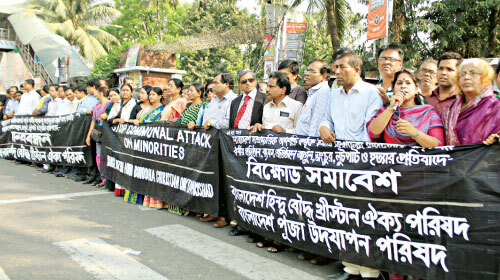 Protest of Minority Hindus are ignored by a pseudo Islamic Country named Bangladesh. File Photo. Armed with sharp local weapons, a gang of about 18 BNP men, led by local Chhatra Dal activist Shaon Islam, struck the village around 12:30pm. They ransacked about 40 houses and looted valuables from those, said witnesses. Basudev Dhar, the Senior Correspondent of Dainik Statesman, Dhaka desk informed that the BNP-Jamaat activists were forcefully collecting money as the expenditure of the hartal. As the Hindus were not ready to give the same, the angry Jamaat-BNP activists plan fully victimized the minority people there. In the last week, 18 shops of Hindus torched in Lalmonirhat amidst the hartal, turned as an easy prey to to attack minority Hindus of Bangladesh. Opposition activists allegedly torched and looted at least 18 shops owned by people of Hindu people in Patgram upazila of Lalmonirhat early Monday on 28th Oct. While leaving, the attackers whom the victims identified as “BNP-Jamaat activists” also threatened the shop owners with dire consequences if they disclose their names to police. Locals said there were at least 50 shops in Shafinagar Bazar but the attackers torched and looted only the shops owned by the people of Hindu community. A victim told that a group of BNP and Jamaat men entered the market and set fire to the shops without any provocation. “Some of them were wearing black masks,” he said. But the man declined to disclose names of the attackers fearing further attacks. Sohrab Hossain, officer-in-charge of Patgram Police Station said he heard about the incident but could not send any force there due to shortage of police members. Sanjay Dutt, general secretary of Bawra union unit of ruling Awami League, blamed BNP and Jamaat activists for torching the shops. But, Shamsul Alam, president of Bawra union unit of BNP, however denied the allegation. One view of procession before Human Chain programme , organized by Bangladesh National Hindu Grand Alliance on 8th Nov 2013 at Dhaka against the Hindu oppression in Bangladesh. It has been reported that on the same day of 28th Oct, in Narinda area of Old Dhaka, the Bhagyakul Mistanna Bhandar (Sweets shop of a Hindu owner), near Gaudiya Math was rampaged and partially looted by the supporters on BNP-Jamaat activists, while a rally was passing there in support of hartal. 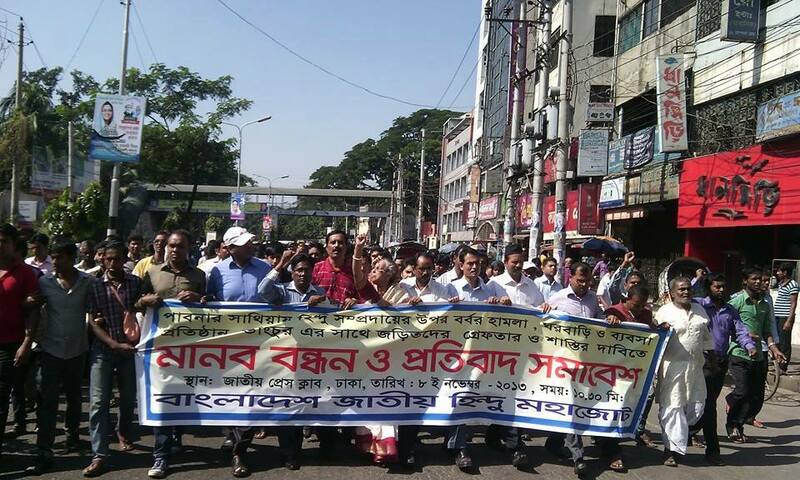 In a protest of Pabna and Lalmonirhat attack on Hindu Minorities, the Bangladesh Hindu-Bauddha-Christian Oikya Parishad (BHBCOP) and Bangladesh Puja Udjapan Parishad (BPUP) organized a human chain, demonstration and press meet at National Press Club, Dhaka on Tuesday, 5th Nov. The leadership of BHBCOP and BPUP alleged that the Hindus have been victimized since 1975 on the basis on fanatic propaganda of Islam and communal politics of BNP-Jammat, as a result of which a huge numbers of Hindu minorities were compelled to leave Bangladesh. All the parties more or less ignored the interest of Hindus and other minorities of Bangladesh. The leadership pointed out that all parties are same including ruling Awami League. At the time of mishap and tragedy of the Hindus in Pabna, the Minister of State, Home Department, Mr. Shamsul Islam Tuku was present at the distance of 15 minutes from the place of occurrence. But, he did not reach there to help or rescue the victimized Hindus and his police reached there after 3 hours later. The attitude of all the political parties are really embarrassing to the existing Hindu minorities in Bangladesh. In this demonstration before National Press Club, Prof. Nimchandra Bhowmik, Advocate Rana Dasgupta, Advocate Subrota Choudhury, Kajal Debnath and Basudev Dhar delivered their lectures and demanded a free and fair Bangladesh without any discrimination upon the minorities there. But, it is very much astonishing that the mysterious Hindus Parliamentarians of Bangladesh have never expressed their views publicly over the atrocities upon Hindu people there. There are seven Hindu MPs in Bangladesh, 3 from BNP and 4 from Awami League. Lists of Hindu MPs of Bangladesh are given below. The readers should knock them. To keep the protests alive and effective against the atrocities, abominations and attacks upon minority Hindus, the Bangladesh National Grand Hindu Alliance will organize a big agitation on Friday, 8th November at 10 a.m. before the National Press Club, Dhaka. Simultaneously, the Bangladesh Hindu-Baudhha-Christian Kalyan Front will organize Protest Meeting all over Bangladesh from 11 am to 2 pm on Saturday, 9th Nov. In a press release, Advocate Gautam Chakroborty of BD HBC Kalyan Front conveyed that whenever a political crisis happens in the country, only the Hindu , Buddhist and Christian temple, shrines and worship places are attacked by Muslim fanatics. They want to create a communal division in the country. The statement condemned the attacks upon Budhhists and Hindus in Ramu , Ukhiya , Teknaf and Patiya in recent past one after another, burning of the traditional temple and scriptural books, attack upon business, households, temples and lives of Hindus in Santhia in Pabna district and physical assault, arson on Hindu community houses of Bonogram recently and the havoc upon Hindus of Lalmonirhat. It’s really sad . The organisation demanded the punishment for perpetrators found guilty through judicial investigation. From a reliable source it is known that the Central Govt of India has alerted the Border Security Force (BSF) in the eastern sector to check any apprehended exodus or infiltration as a result of the recent turmoil ongoing in Bangladesh. Muslims are on top for Demonic activities. They say they believe in Allah but behave like Demons. Reblogged this on hindureverberation's Blog. 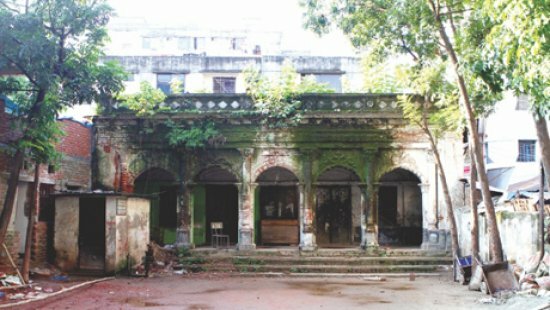 This entry was posted on November 7, 2013 by hinduexistence in Attack upon Hindu Temple by Muslims, Attack upon Hindu-Buddhists by Muslims, Attack upon Hindus & Hindu Temples, Attack upon Hindus by Muslims, Bangladeshi Hindus, Conspiracy against Hindus, Hindu - Buddhists attacked in Bangladesh, Hindu Existence, Hindu Protest, Hindu Tradition and Culture under attack, Hindus under Islamic Aggression, Islamic Menace, Minority Watch in Bangladesh, Persecuted Hindus, Save Bangladesh Hindus, Threat Perception on Hindus in Bangladesh, Torture upon Hindu - Buddhists in Bangladesh, Violation of Hindu Rights and tagged Attack on Hindus - A concern of US not of India, Attack upon Hindus in Bangladesh, Awami League, Bangladesh Hindu-Bauddha-Christian Oikya Parishad (BHBCOP), Bangladesh Hindu-Baudhha-Christian Kalyan Front, Bangladesh National Grand Hindu Alliance, Bangladesh Puja Udjapan Parishad (BPUP), Bonogram in Santhia of Pabna Upazila, Dying Hindus in Bangladesh, Hindu MPs of Bangladesh, Hindu Persecution in Bangladesh, Hindus in Pabna and Lalmonirhat, Jamaat-BNP, life-saving tax (read Jizya) in Bangladesh, National Press Club - Dhaka, Satpatki Majhipara under Lalmonirhat Sadar upazila, US is deeply concerned with the attacks on Hindu minorities in Bangladesh.